I am so excited to share this fabulous and FREE Summer Fun eBook with you put together by my friend Mandi at Life Your Way!! 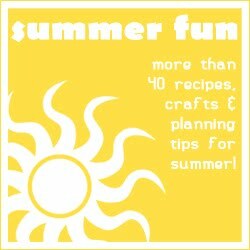 This eBook contains more 40 recipes, crafts, activities, and planning tips for summer and includes TWO of EJ's awesome ideas!! You can also download or print these free printables listed below for even more summer fun! The following bloggers contributed to this awesome eBook. You can head on over to their sites to find even more great ideas to use this summer! Amanda @ Impress Your Kids. If you download or print this eBook, I'd love for you to stop by Life Your Way and leave a note here letting Mandi know how much you appreciate all of her hard work to put it together! I am excited to try out all of these activities, crafts, recipes, etc. this summer! I think my Summer Bucket List just got longer! !